Need a copy of your ITIL Certification? « Knapp I.T. Have you heard the news? ITIL 4 is on the way in 2019! Need a copy of your ITIL Certification? I get calls and emails all the time from former students who have lost their ITIL Foundation certificate, and need a copy quickly. I wish I could get it for you, but I can’t! Regardless of what training company you used when you took training from me (TEK Systems, New Horizons, ProTech, BridgeView, Knowledge Peak, Pultorak and Associates, NETD, etc. ), your exam itself was purchased from (and graded by) one of four Exam Institutes (“EI”s): EXIN, Loyalist Certification Services (LCS), PeopleCert, and APM Group (APMG). One of those companies has your grade and your certificate… not me. During class, I made you sign into the website of the Exam Institute (either EXIN, Loyalist Certification Services (LCS), PeopleCert, and APM Group (APMG)) that TEK Systems bought the exams from (again, TEK happens to use EXIN), and you created a username and password for the EXIN website, and also you gave EXIN your email and snail-mail address, plus a bunch of other information. Once you were done with your exam, I sent your exam paper to the Exam Institute to be graded. The EI then graded your exam and gave you your results via email. I was completely out of the picture by that point. So, your grades are completely between you and your Exam Institute. Because I teach for so many companies, I can’t easily list out what training companies use which Exam Institute, especially because training companies can change EIs at any time– so maintaining an accurate and updated list here for you would be nigh impossible. If you still have access to your ITIL Foundation workbook, you can look in the first section of your workbook and there should be a slide that talks about the exam… hopefully there is information about who your exam institute was. Because I have taught for many different training organizations over the years and they all use different workbooks, I can’t tell you where to look in your workbook because I don’t know what workbook you have. If you still work for the same company you worked for when you took the training and exam, search your email for your certificate. Your certificate and exam results were sent to your email address. Search for “ITIL” first. If you don’t find anything, then try searching for the name of the Exam Institutes, which are EXIN, Loyalist Certification Services (LCS), PeopleCert, and APM Group (APMG). If you don’t work for the same company anymore and no longer have access to your former job’s work email, then you’ll have to contact the Exam Institute directly. I have no way of knowing what Exam Institute used to take your exam, so you’ll have to check with each of them, which are EXIN, Loyalist Certification Services (LCS), PeopleCert, and APM Group (APMG). If you checked the “Include my name in the successful candidate register” box when you signed up for the exam (it was in with all the privacy stuff, so many times people don’t check the box), then your name MAY be in the Successful Candidate Register maintained by AXELOS. (AXELOS is the governing body of ITIL– all of those Exam Institutes Report up to them.) Look up your name; maybe it’s there! Your last resort is to contact the company (not me, your trainer) who performed your training… sometimes their logo is on the cover of your workbook, and with any luck their contact info is also there. They can look you up since you (or your company) paid them for your training. 2018 UPDATE: If you took your exam in 2018, there is only one Exam Institute handling ITIL exams for every student and company worldwide; and that company is PeopleCert. So if you took your exam in 2018, check your email for anything from PeopleCert, or go to the PeopleCert website and simply log in there to grab a copy of your certificate. Easy peasy! That’s all the information I have, but I hope it helps you out! If you can’t get a copy of your certification, then I can certainly point you in the direction of a FANTASTIC series of ITIL self-study videos featuring ME! Once you watch the videos, you can go to EXIN or PeopleCert’s website and sign up to take the ITIL Foundation exam online from any computer with a webcam! 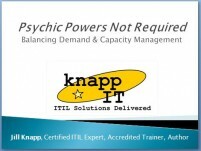 2 comments to Need a copy of your ITIL Certification? So happy to hear it! Thanks for swinging by! Click the image, and watch the archived version. Runs 47 minutes. Copyright © 2019 Knapp I.T. - All Rights Reserved. ITIL® is a Registered Trade Mark of AXELOS, Ltd. IT Infrastructure Library® is a Registered Trade Mark of AXELOS, Ltd.